Diane K. Luci joined NIH in 2010 and now works at NCATS as a medicinal chemist in the optimization of small molecules that are identified by the high-throughput screening campaigns. She has worked on projects in oncology, parasitic diseases and metabolic diseases. Luci received a Master’s in organic chemistry from the University of Pittsburgh, where she studied with Peter Wipf, Ph.D., on the synthesis of analogues for the study of CDC25 dual-specific phosphatase. In 1999, Luci joined Johnson & Johnson, where her work included projects for ketohexokinase, αvβ3 and urotensin II inhibitors. In 2011, she received the Technical Achievement Award in Organic Chemistry from the American Chemical Society in recognition of this work. Luci enjoys working at NCATS because of the collaborative research environment. She also enjoys forming productive and long-lasting collaborations with researchers from academia, government and pharmaceutical companies. 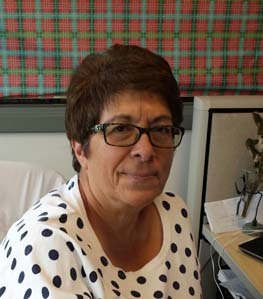 Her research interests include medicinal chemistry, synthetic methodology, and rare and neglected diseases research. Luci focuses on the medicinal chemistry optimization of small molecules to demonstrate activity in proof-of-concept animal models. The ultimate goal is to facilitate advancement of these compounds into pre-clinical and Investigational New Drug–enabling studies. First Selective 12-LOX Inhibitor, ML355, Impairs Thrombus Formation and Vessel Occlusion In Vivo With Minimal Effects on Hemostasis. Synthesis and structure-activity relationship studies of N-benzyl-2-phenylpyrimidin-4-amine derivatives as potent USP1/UAF1 deubiquitinase inhibitors with anticancer activity against nonsmall cell lung cancer.